2 days before French election to take place, Macron has been under a massive hackâ€”with doctored and falsified documents dumped alongside real documents to smear him as much as possible to benefit Putin-funded alt-right Le Pen. How familiar. Thankfully Macron had an enormous larger lead, that hope against hope heâ€™ll win regardless. I wouldnâ€™t wish this on any country and France is a critical election considering it and Germany are the center of the European Union. If either of them leave the E.U., itâ€™s done, which would be disastrous for the world. Macron won. He's not perfect, but at least he isn't as flawed as Le Pen (or associated with as disturbing a party). I think the fact that Trump won in the US despite people thinking Clinton had it in the bag, and that even though she was far from perfect at least she wouldn't lose to that orange buffoon. So I guess even the people who didn't like everything Macron had to say knew they still had to cast a vote on him if they didn't want to risk Le Pen winning. And with that out of the way, now the French can start to put pressure on Macron regarding his economic policies, which are by far his least favourable. And this is the thing, people would have been able to battle Clinton and put her feet to the fire. With Trump, everyone gets screwed over but the rich and there doesn't seem to be any end in sight to all the damage he can and will do. Bill Maher made a good point about this during his most recent show. Clinton could have been there for four years tops and you could easily have pressured her on her more questionable positions while she was in power, and if she was to be impeached you'd at least have a decent replacement for the remainder of the presidency. Not French, but happy for France. I personally think this was the better choice after reviewing both sides. Yes, thank God he won! Thankfully Putin's stooges have lost in Australia, the Netherlands (which used paper ballots because they feared election interference), and now France. Hopefully Angela Merkel will win her re-election in Germany. Germany and France need to stay strong while Britain and the U.S. are undependable and in complete chaos. I've heard Merkel being referred to as the leader of the free world lately--which was the U.S. president's title once upon a time. Maybe Trumpâ€™s existence has helped to steer other countries in the right direction. They saw how voter complacency failed the U.S.
You know what I'm taking away from this? I watched an episode of John Oliver addressing the Canadian election. He then went on to say that many Americans probably did't know this; my first thought to this was "Come on guys! We are literally right next door to you! We're one of your main trade partners and your biggest oil providers! Our election could literally affect your economy in ways that defy physics! (exaggeration)" But now that a French election has come and gone, and seeing as how Canada is bilingual (Quebec (some Montreal)=Francais), I must apologize to the American public; I too am just human, like you. One thing I don't understand is this a lot of The_Donald users took it upon themselves to involve themselves in this election, campaigning for Le Pen. This comes after a lot of them blasting liberals from across the world for "involving themselves in US politics". Glad to see they lost. Already, they've started whining about how 'islamified' France is. 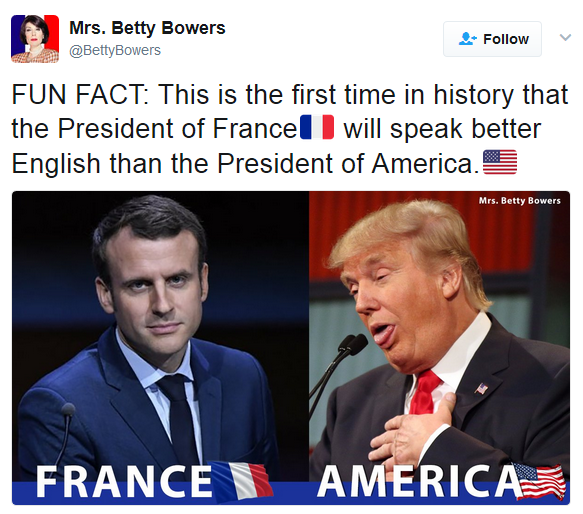 I was right before that Macron was able to use Trump's ascension as part of his strategy. Apparently he ran ads with clips of everyone in the U.S. talking about a certain victory for Hillary followed by: "The Worst Is Not Impossible. Vote." I'm glad the rest of the world may be able to benefit from the U.S.'s stupidity, complacency, and evil.